Mount is absurdly large and not very stable. Uses 3 AAA batteries in a little canister with small contact area. Sometimes while riding the light flashes off for a moment when riding over bumps, because the battery holder loses contact. 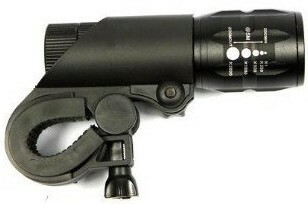 The adjustable lens is almost pointless, because the beam is too tight even at the widest setting. Overall build quality is mediocre at best. No voltage regulation, so the beam gets significantly dimmer as the batteries drain. Actual lumen output is less than half of claimed output. This is another off-brand light from China with a high brightness claim and a low build quality. Although the price makes it tempting, the overall cost of ownership will be higher when you factor in how quickly it goes through AAA batteries, and I don’t trust this light to last very long.